The black walnut is native only to North America, specifically the Mississippi drainage basin. Today, the common eastern black walnut is also grown in the Southeast and California. The very nature of the walnut makes it one of the most useful native fruits in our flora. You can eat it, clean with it, use it to make cosmetics and paints and add it as filler in dynamite. Wow! What more can you ask for from a nut? Edibility is one of the first things people think of when considering plants “useful.” The walnut ranks high on the edibility charts. Indigenous people have included walnuts in their diets for hundreds of years. The Black walnut is also highly nutritious. Nutrient analysis reveals that walnuts supply essential minerals, antioxidants, and fiber. Black walnuts have more protein than English walnuts and contain arachidonic acid (an Omega-6 essential fatty acid). 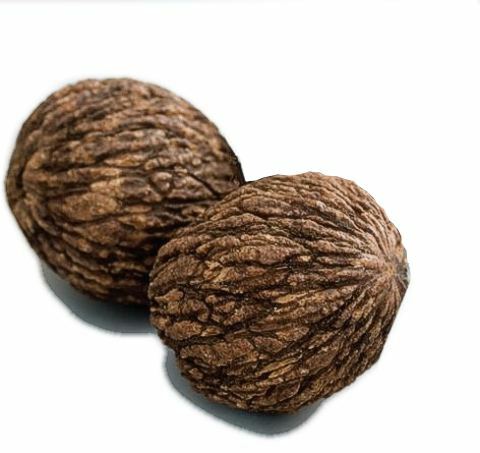 Black walnuts differ from English walnuts with a flavor that is stronger, richer and smokier and sweeter. Black walnuts are also notoriously tough to crack, and once cracked they must be handled with gloves, since the oil in their shells leaves a brown stain on the skin. These nuts add a distinctive hearty flavor to baked goods. The nut shells and wood of the black walnut tree are prized too, as this is a multi-use tree. Native Americans made dye from the nut husks, and woodworkers value the extreme hardness and straight grain of the timber. Other industries use the hard shells of black walnuts in plastics, glues, sand-blast cleaners and metal polishers. Black walnuts work wonderfully in baked goods or confections such as cookies, fudge, brownies, cakes and candies; they can even be used as a meat substitute in certain dishes. This product can be drop-shipped directly from the processor in 35 pound cases or ordered from our warehouse with a one week pre-order to be shipped on your truck.